Mud Puppy provides everything from Walk-in Nail Trims, DIY Dog Wash to Professional Dog/Cat Grooming and Boarding! Our goal is to go the extra mile for you and your pet. We strive to give the BEST to your pet in every aspect: Shampoos, Treats, Dog Beds, Grooming equipment, Staff, ect.. We believe your pet deserves a clean, safe environment where they can be themselves. We do our very best to work with pets that may have special needs or maybe even a bad reputation at other grooming locations. Our prices are very competitive and stay with in a few dollars of other pet paradises. We are confident you will be satisfied with our prices as well as our services. If not- Please do tell us so that we can make it right! Customer satisfaction is very important to us at Mud Puppy. We love our 4 legged and 2 legged clients alike! ❤Mud Puppy’s very top priority is to maintain a safe and clean environment for your pet. ❤We do hold the right to refuse service to any pet that shows aggression towards people or other pets. ❤There are situations that cause the groomer to not be able to finish a groom. In this case, you will still be expected to pay for the services completed. ❤We ask that you pick up your pet within reasonable time (1hour) after you receive notification that their groom is complete. If you need to leave your pet for any period of time that exceeds the 1 hour, you will be charged a day care fee. ❤We need to know any and all health issues,allergies,behavioral issues,ect. at time of drop off, to ensure we can care for your pet appropriately while in our care. ❤Mud Puppy requires all pets that enter our facility to be fully vaccinated. Proof of vaccinations or “titer test” must be given at time of drop off. ❤“How long?” We all have busy schedules, at Mud Puppy we will do our very best to accommodate any time restraints we are made aware of . Grooming is not always a straight through process and any “rushing” can cause accidents. Please be patient- we will call when your pet is ready for pick up! ❤Your Pet is too cute not to post! We have rights to any photos taken in our salon! Get ready to “ohh” and “ahh” over the cuteness! ❤We are not responsible for any injury caused during the process of shaving down or de-matting a matted dog. We take as much precaution as possible but with matting being so close to the skin, irritation, nicks or cuts can easily happen. ❤If any accidental injury were to happen while under the care of Mud Puppy, we will call the number we have on file and let the owner know so that we can take the proper steps in getting outside care (if needed) to the pet. UNLIMITED* SELF-SERVE IS ONLY $20 PER MONTH! Note: D.I.Y tubs will shut down 30 min before closing to ensure squeaky clean tubs for the next day! Do you have a long day at work? Pets stuck in a crate all day? Active Puppy that needs some socializing? Drop off your pet for DAYCARE! $15 allows your pet to stay all day! While your pet is with us they will be able to play with other pets, have frequent potty breaks, rest time (if needed), fresh water, T.V time, leashed walks outside, and of course BELLY RUBS! We suggest bringing your pet in for a day/half day of daycare before their scheduled boarding drop off date if they have never boarded with us before! If your pet is found to have fleas, they will be treated with a flea bath + “Capstar” at the owners expense. We ask to please bring your pets food to keep their bellies on track, if not, we will provide their food for $2 per cup. Pets MUST be up to date on all vaccines suggested by their vet. Please label your pets belongings with their name to help us stay organized. We provide bowls and bedding for your pets stay with us. WE ARE NO LONGER ACCEPTING PETS THAT REQUIRE MEDS. We strongly suggest boarding these pets at a veterinary office. At home coat care is an absolute must. When dogs hair is not brushed, it becomes tangled, and over time matted. Matting is not always easy to spot just by looking at the dog. 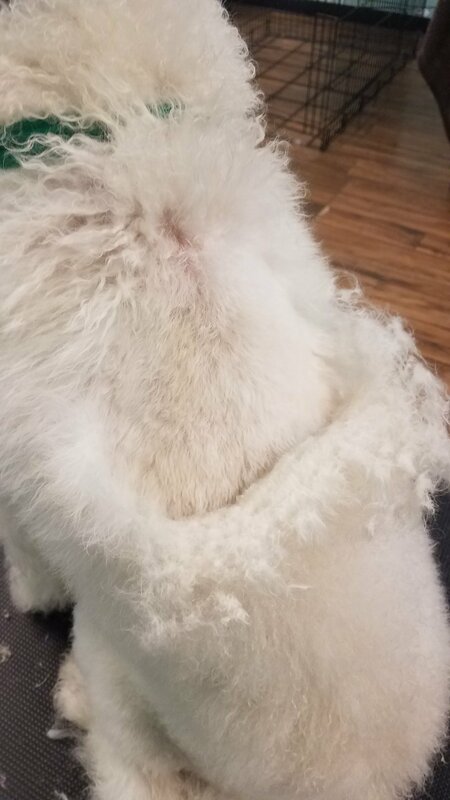 The surface of the coat may look cute and curly, but the hair closest to the skin is where matting starts. Matting is VERY uncomfortable for your dog. Removing matting is time consuming and can be very dangerous. We urge you to never try to “cut” matts out of your pets fur at home, Please leave it up to the professionals. Accidents can happen easily when working so closely to the skin with sharp tools on a wiggly animal. If you desire a long “fluffy” look for your pet, you will have to properly brush your dog at home and bring them in to see us on a regular basis! We would love to show you the tools to use and how to make “brushing your dog at home” something fun for you and enjoyable for your pet! This pet did not “appear” matted but was! We want nothing more than to please our clients by giving your pet a hair cut you and your pet will LOVE! Hi! My name is Morgan, and I was born with a passion for animals. My home has a revolving door open to provide a safe haven for foster dogs, bottle fed kittens, and neighborhood strays. I am blessed to be able do what I LOVE with my career as a dog groomer. I strive to provide the absolute best care and quality experience for your pet. I treat each dog as if they are my own while in my care. In my free time, I enjoy spending time with my husband and daughter gardening, camping and serving our church. Laila! You may see this creature snuggling on a dog bed with your pets and her tablet. She would rather be playing at home but she makes the best of picking up poo and cleaning drool off of windows. I pray the days she spends at the shop instill a lifelong love, appreciation and RESPECT for animals. Jessie works part time grooming your pets here at Mud Puppy and is also a certified Real Estate agent! She has groomed many years in multiple states and her reputation has followed her. Making sure you get what you want and your pet gets what they need is her specialty! Even the most anxious of pets are at ease in her care. Michael takes exceptional care of your pets while they are with us! Whether he is taking your pooch out for a walk, monitoring play time or lathering them up for a bath, they are in the best of hands! Michael handles each pet as his own. We are truly blessed to have him!